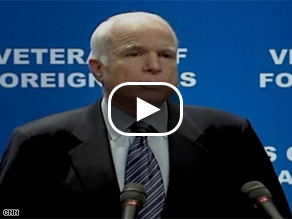 Watch a clip of Sen. McCain's speech Monday. (CNN) – Sen. John McCain, the Republican Party’s presumptive presidential nominee, said that as president he would ensure veterans receive proper care upon returning to civilian life. McCain’s speech Monday at the headquarters at the Veterans of Foreign Wars in Kansas City, Missouri comes in the wake of attacks by prominent supporters of Sens. Hillary Clinton and Barack Obama over the Arizona senator’s record on veterans’ benefits legislation. “When our government forgets to honor our debts to you, it is a stain upon America’s honor,” McCain told the audience. Wesley Clark and Ed Schultz, backers of Sens. Hillary Clinton and Barack Obama, have recently attacked McCain over his support for bills regarding veterans’ benefits – especially given McCain’s staunch support for the Iraq war and recent efforts to tout his own military service as part of his presidential campaign. Schultz,an Obama supporter and liberal radio talk show host, also took issue with McCain’s voting record on veterans’ benefits since 2001. “He has kicked the veteran to the side of the road like road kill with his votes,” Schultz told CNN's John Roberts. Late last week, former U.S. Army Gen. Wesley Clark, who supports Clinton, also targeted McCain for his failure to support a bill regarding veterans’ benefits that is currently pending in the Senate. McCain was a naval fighter pilot during the Vietnam War and spent five and a half years as a prisoner of war. He is absolutely right! and why after spending his life in politics has he not done something about this problem??? He apparently doesn't want veterans to get a college education either. Hey! Then they have to reenlist to get decent pay and medical care. Right? Obama SPONSORED the Dignity for Wounded Warriors Act of 2007. Didnt McCain refuse to sign the new GI Bill? I will bet Mccain has been triple dipping with the Veterans admin service connected disability[which he rightfully earned and deserves] But he should be honest enough to ensure other deserving vets get there due. I will bet that another Mccain will somehow find that he somehow will be eligible for the same if he earned it[he deserves it ] but with the powers to help get it sooner than most other deserving persons who do not have a connection to get to the head of the line. McCain's son has been to Iraq unlike most politicians sons and daughters aren't in the service. If Hillary doesn't get the nomination my vote will be for McCain, a true patriot!! HELP OUR VETERANS NOW..TOMORROW MAY NEVER COME FOR MANY VETS...HISTORY IS SOMETHING THAT HAPPENS TODAY....SO.. START TODAY TO CHANGE THE FUTURE. PROVE THAT THE LEADERS OF THE USA CAN AND WILL ENSURE AID TO ALL OF OUR VETERANS, NOT JUST THE RICH AND FAMOUS. Blake you are right. As a Senator, Mc Cain didn't do anything to help veterans. His voting record doesn't lie. And yes, Sen. Obama has been pushing to help the veterans (and our troops now serving) for a long time. I used to think Sen. Clinton would be a good candidate, but lately, I don't know. I'm leaning toward Sen. Obama. John Mccain has been in the Senate for 20+ years. John Mccain wants to Privatise the VA, HOW IS THAT TAKING CARE OF VETERANS? Let us not forget it was BARACK OBAMA who blow the whistle on Walter Reed, so for 3 years he did allot, where was JOHN MCCAIN. John Mccain in an opportunist, who hide in the HILTON Hotel drinking coffee and sakki while everyone else fight the WAR. G. W. Bush was correct in 2000, when he said MCCAIN isn't no real HERO! I can't wait for OBAMA to resuse all the ADDS that G.W. used against MCCAIN, no need to create new ones, use the old ones that G.W. use, it was good enough in 2000, it is relevant today. If G.W. had so much to say about MCCAIN then, then obviously he still believe it today. Mccain is not a champion of Veterans rights, he is a Johnny come later! Sen. McCain's voting record re veterans is a personal, as well as public, disgrace. This is especially evident considering his POW status. My family is comprised of several generations of vets, including two WW II POWs (my dad and an uncle who, like McCain, was shot down). We've had combat and non-combat members in all the regular armed forces and the National Guard. We've been stationed all over the world, having served in every war and almost every conflict since WW II. The brother with the longest career devoted over 25 years and saw his fair share of ugliness. Our youngest vet served with the USMC in Iraq and lost his best friend his first day in country. He's still serving. So, Sen. McCain, why have you forsaken our wounded ones? Whatever their wounds, every man and woman who has been wounded in the service of our country deserves better. Si se puede! Obama 2008!